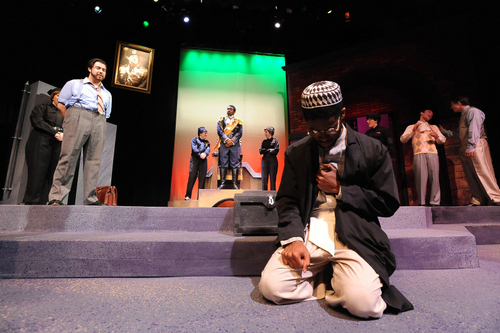 If you missed the premiere weekend of Loyola University’s production of Shakespeare’s “Merchant of Venice,” you have a few remaining chances to catch it through Saturday. 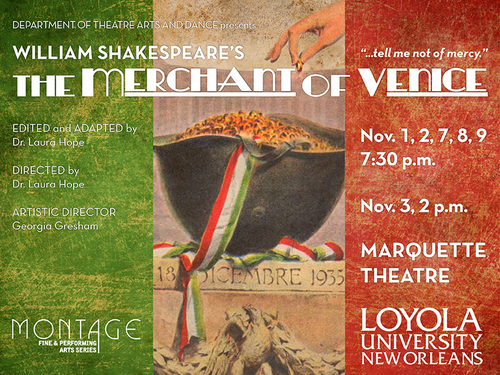 The world of William Shakespeare comes to life in November as the Department of Theatre Arts and Dance at Loyola University New Orleans presents the bard’s groundbreaking dramatic masterpiece, “The Merchant of Venice,” an unforgettable tale of mercy and justice, generosity and greed. Directed by associate theatre professor Laura Hope, Ph.D., the play will run in the Marquette Theater on Loyola’s main campus Nov. 1, 2, 7, 8 and 9 at 7:30 p.m. and Nov. 3 at 2 p.m.
“The Merchant of Venice” mixes elements of comedy and tragedy to provide a complex exploration of religious and ethnic discrimination, hypocrisy and rampant materialism. In the midst of the play’s scrutiny of controversial issues, however, Shakespeare composed some of his most beautifully lyric language for the theatre. The power of Shakespeare’s poetry and prose, combined with his searing examination of the social issues still plaguing humanity centuries after the play’s debut, make this a not-to-be-missed theatrical event. Tickets are $12 for general admission and $8 for Loyola faculty, staff, students and seniors. For tickets and information, visit montage.loyno.edu or call 504-865-2074. Free parking is available in the West Road Garage, accessible from St. Charles Avenue.